At First Choice modern sewage treatment plants are rapidly replacing septic tanks as a much more environmentally responsible and long-term solution. That’s because sewage treatment plants actively harness natural processes, such as aerobic bacterial digestion, to help break down and neutralise sewage. 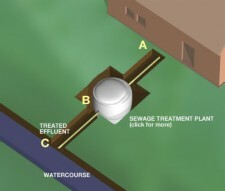 A – Wastewater and sewage from the property is fed through to the treatment plant. B – The treatment plant allows the solids to settle out and actively treats the sewage via an aerobic (oxygen-dependent) process, breaking it down. C – The resulting effluent, which is typically 95% clean, can be discharged into a nearby ditch, stream, river, lake or land drain system, subject to appropriate approvals. Want To Understand More On The Sewage Treatment Plants? Then Don’t Hesitate To Get In Contact Today! 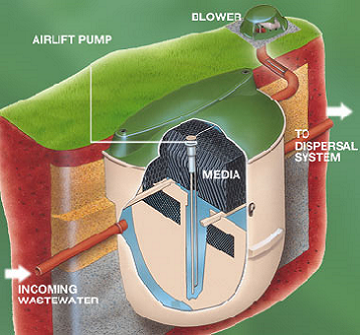 The compact, below-ground sewage treatment plant depicted in this cutaway illustration is a watertight enclosure designed to allow solids in the sewage to settle and decompose via an aerobic (oxygen-assisted) biological action.